We all love the sugary, fluffy, melt-in-your-mouth deliciousness of a fresh spun cone of cotton candy. Now you don�t need to wait to find someone selling a bag of cotton candy -- you can make it quickly and easily at home. Make cotton candy whenever you want with the Cotton Candy Express Brand cotton candy machine. This machine is perfect for making cotton candy at parties, at barbeques, or just because you want a sweet treat! 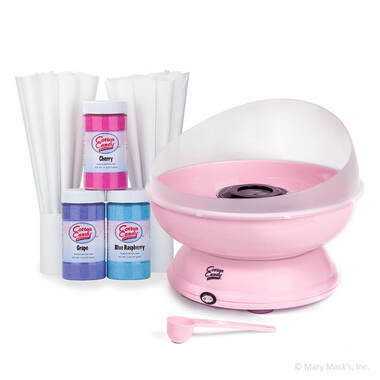 Plug the pink cotton candy machine into a standard 120-volt outlet, and you�re ready to get started. Choose one of the three 11 ounce plastic jars of cotton candy floss sugar and add the proper amount as directed. Right before your eyes, you can make cherry, blue raspberry, or grape cotton candy. Spin the cotton candy onto the 50 included paper cotton candy cones. The Cotton Candy Express machine is durable and also comes with a one year warranty. Once you�re done making your cotton candy, you�ll find the machine is very easy to clean. It also comes apart, making it easy to store for another day of delicious cotton candy.